Ouch! Tracy Morgan Disses Ben Affleck Over Jennifer Garner In His Batman V Superman Review! [tps_footer]Hollywood actor Ben Affleck‘s latest release ‘Batman V Superman: Dawn of Justice’ released worldwide last week on March 25, 2016. The film left the fans divided and for real. Some absolutely hated the film, some loved it and critics pretty much bashed it. In all, the film still is doing pretty well at the box-office and has beaten Marvel ‘Avengers: Age of Altron’. 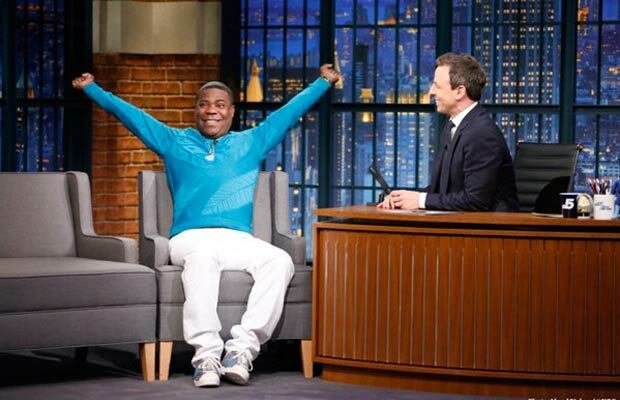 In the review season itself, Tracy Morgan also had some colourful things to say about the film. The comedian turned actor appeared on NBC’s ‘The Late Night’ talk show where he reunited with his oldest friend Seth Meyers. For those who didn’t know, Tracy was the one who took Seth under his wing during ‘Saturday Night Live’ days. The audience started laughing and so did Seth. If you don’t know already, Ben Affleck split up with his wife Jennifer Garner last June. Rumours were doing the rounds that Ben cheated on Jennifer with their kids’ nanny. Jennifer put down the rumours to rest, recently when she gave an interview stating they separated way before they announced their separation. Well, all we know is Tracy never holds back when it comes to comedy. Previous articleAnushka Sharma Will Play A Witch In Phillauri ?